Obi Eze Chima being the first, Obi Nnaemeka Achebe is the twenty-first in a dynasty that has thrived for more than four hundred years. He occupies an important position among the people of Onitsha and he is personally associated with the conduct of essential aspects of Onitsha local affairs. 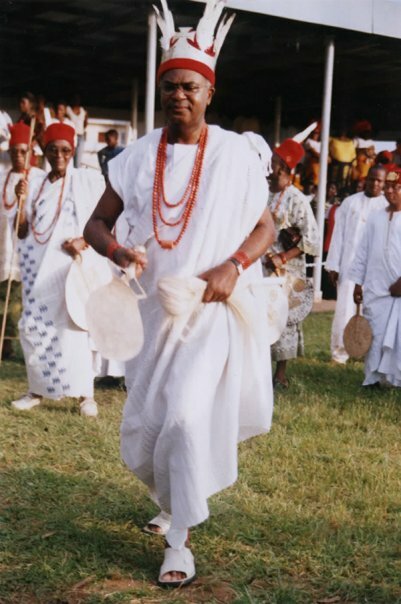 Though, there are further requirements for a candidate for the Obiship of Onitsha, the monarchy is reserved for the male descendants of the ‘Founder of State’ – Eze Chima. These descendants are known as Umuezechima or ‘Children of Eze Chima’. This classification encompasses many villages in Onitsha , and in modern times, it produces a hotly contested Obiship whenever there is a vacancy. The semi-divine or spiritual nature of the Obi is expressed in how his subjects address him. He is addressed as ‘Igwe’ or ‘Sky’. The other terms used are ‘Agbogidi'(All Powerful), ‘Enyi'(Elephant) and ‘Agu'(Leopard). He is also greeted as ‘Nkpu'(Ant-hill), for just as ant-hill has many openings so the king has many eyes, being aware of whatever happens in the town. Being semi-divine, he is the embodiment of the spirit of the ancestral god. Traditionally, he confines himself to his house. This confinement sets the stage for one of the most cherished events in Onitsha- The Ofala Festival. Historically, it is the only occasion that the Obi presents himself publicly to his subjects. It is also the occasion for Obi’s subjects to pay or reaffirm their allegiance to the monarch. 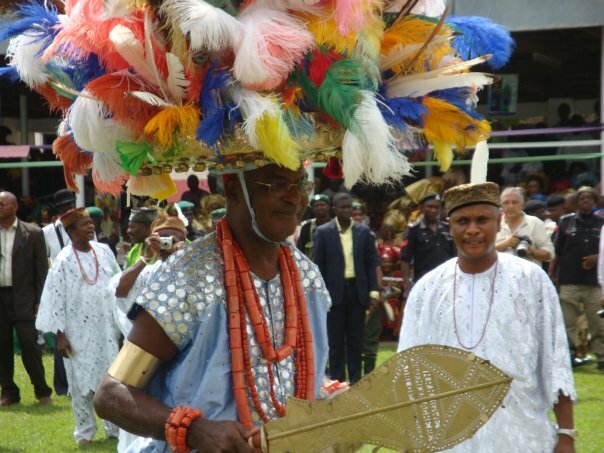 Leaders of every clan, including Ndichie(Red Cap Chiefs), Agbalanze(Ozo title holders) and other participants, decorated in regalia and accompanied by special musical groups, converge at the Obi’s palace annually for this joyous event. 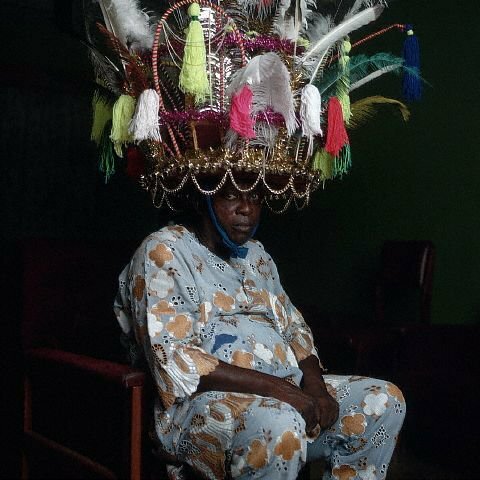 This festival attracts monarchs and spectators from other parts of Nigeria. Presently, the monarch’s ruling functions are diminished, however he wields a great influence within Onitsha and beyond. At the apex of the political and social organizations in Onitsha, is the institution of Ndichie. Ndichie are the ‘red cap chiefs’ who hold positions of authority and influence. These men are the Obi’s(King’s) main administrators of policies that emanate from his palace. These titles were originally bestowed on men who distinguished themselves in war, however, the amount of money payment has emerged as the dominant feature today. It is the prerogative of the Obi to install a new member of Ndichie. It occurs when there is a vacancy due to death. There is a presumption that a candidate must be a member of ‘Agbalanze’ (Ozo title holders) society but the Obi can use his discretion to confer this title on a non-member of the society. An example of this was when Obi Okosi installed Agbakoba Ezenyelugo of Umuasele as the Asagwali. The process of installing a new member of Ndichie remains an elaborate one that can strain the financial resources of the aspirant. There is a hierarchical structure within this group. The stratification is as follows: Ndichie Ume; Ndichie Okwa; and Ndichie Okwaraeze. Ndichie Ume, with a maximum number of six, are the most powerful and are considered the senior members of the Obi’s inner circle. Prominent among this group is the ONOWU, who is likened to a Prime Minister. He performs the administrative and social functions of the Obi during an interruption in continuity of the monarch. Such an interruption can be as a result of abdication or death. Members of Ndichie Ume function as war chiefs while the other classes, Ndichie Okwa and Ndichie Okwaraeze, serve as their assistants. The remaining members of Ndichie Ume, in order of seniority, are AJIE, ODU, ONYA, OGENE, and OWELLE. Regardless of the class, the Ndichie constitute the Obi’s Executive Council. They act on behalf of the monarch in their various localities and perform law enforcement duties as well as being the arbiters of customs and traditions.